Impossibly rare and hotly desired rookie card from the world of vintage basketball. This card never surfaces in such high grade with the offered specimen representing one of just a dozen PSA 8s ever awarded in over 25 years of professional grading. As good as it gets and not to be overlooked. Part of a jaw dropping '33 Sport Kings set break on the auction block this month. 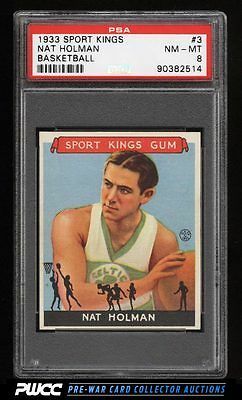 This offering represents the current #1 finest '33 Sport Kings set on the PSA registry and is deserving of serious attention. One of over 11,000 cards, lots, and sets up for bid in our 9th Auction of 2016. Click on the link above to view the other PWCC auction lots.